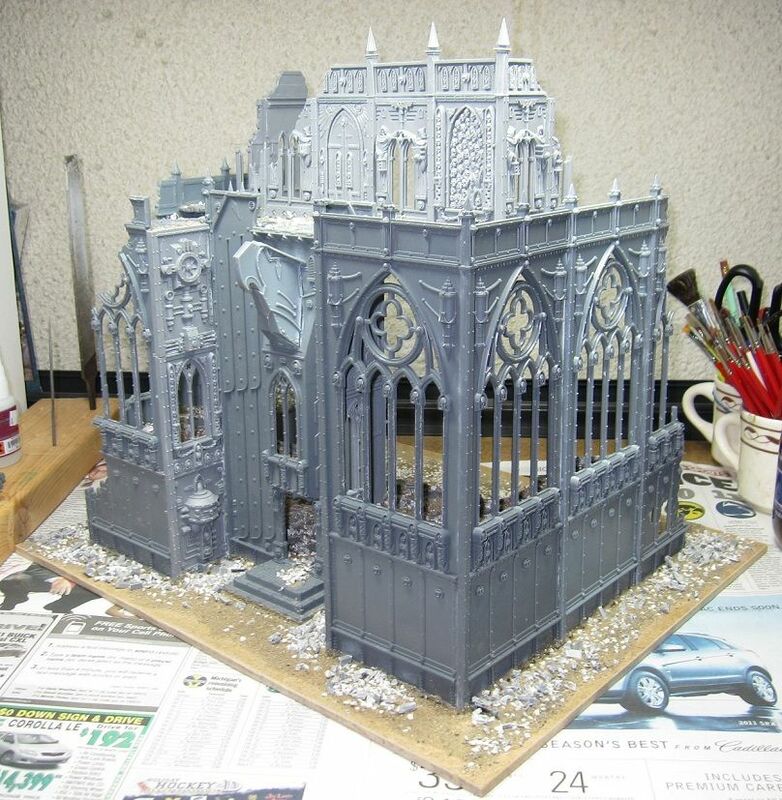 I am going holding off on updating my Grey Knights army at this time for several reasons. First, a friend of mine is very interested in acquiring my Grey Knights. Given that I feel I already have too many armies, I may just take him up on it, provided that I can get something good in return. Second, it is looking like I may be trading the WHFB Empire army I was given a few months back for some used Tomb Kings stuff. If the trade goes through, I would prefer to work on this army over Grey Knights. This would be good timing given that the new army book is due out in just over a month. I am very anxious to see what the new book holds. Back when I was trying to choose a WHFB army last year, Tomb Kings were my first choice. But I went with Ogre Kingdoms, my second choice, because everyone said to wait until the new book comes out. And lastly, I am going to be playing in a league with my local gaming group that will be starting in three weeks and I am going to use this to focus on painting one of my armies, either Blood Angels or Cadians. Leagues are great motivators to get your army painted if it is not already. I am having a tough time deciding which army to do though. So, Grey Knights will remain on the shelf for the time being. I made more progress on my Shrine of the Aquilla this weekend. I got it based and added some rubble to it. Here are some pictures. Once I got it based, I was glad that I did not make it bigger like I wanted too. The base ended up being roughly 17 x 14 inches as it is. 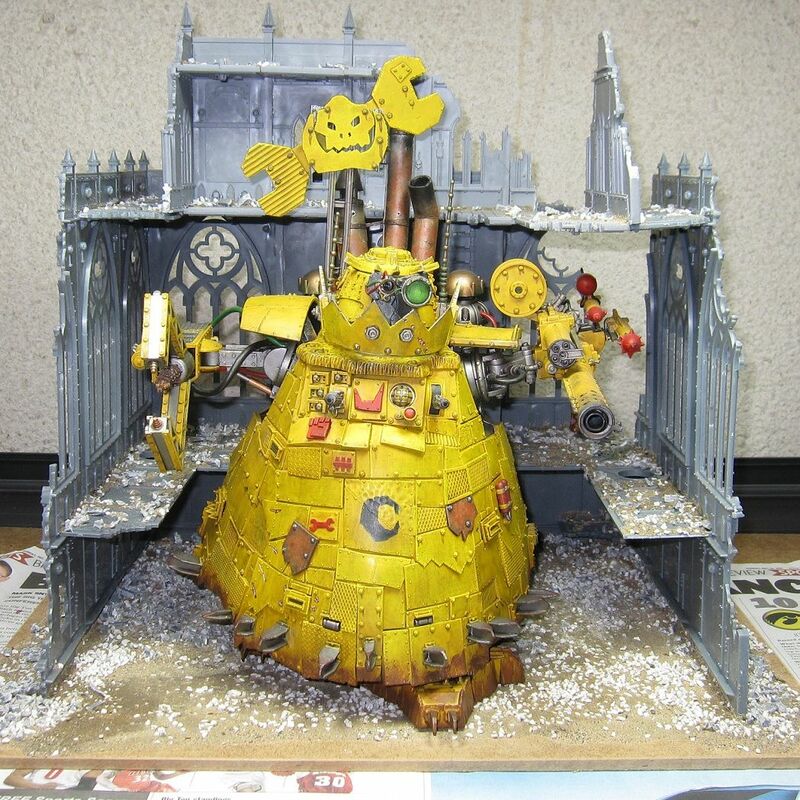 It big enough to fit my Mig Mek Stompa inside of it. Anyway, I made the rubble using a mixture of basing ballast, sand, and plastic sprues that I ground up using a hand meat grinder that I keep just for making rubble. It works great. 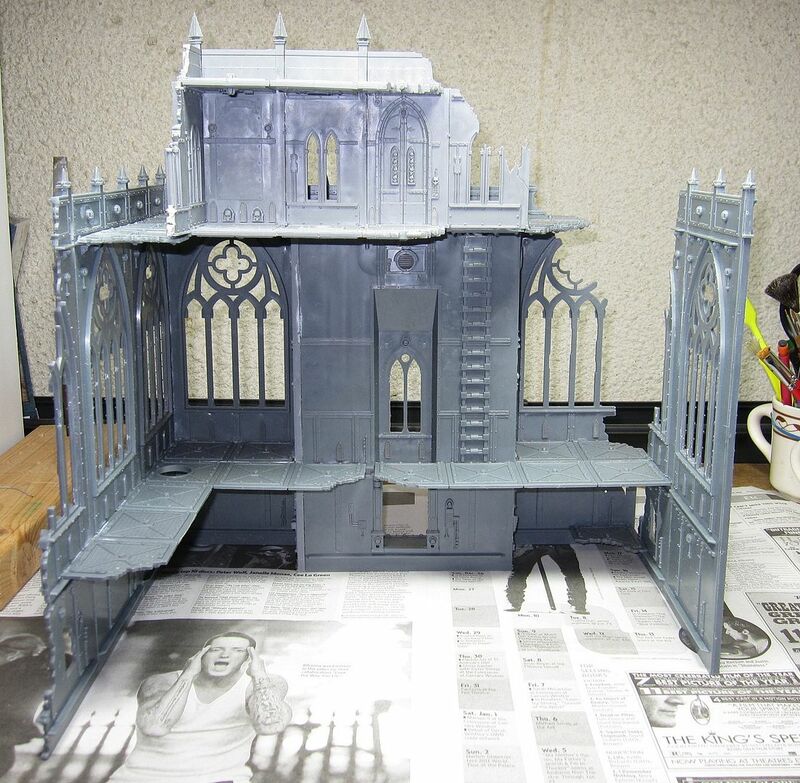 I still want to add some more detail to it before I declare it ready for painting, especially to the interior. It needs something more, I am just not sure what to add at this time. Maybe some fallen floor panels or rubble piles. I am planning to make this my Painting Challenge Project for the month of May, so I still have some time to work on it. I decided to take a break from painting this weekend and I started building my Shrines of the Aquilla I got for Christmas. Using some left over Cities of Death building panels that I had, I was able to build quite an elaborate, and somewhat large, ruined building. I have a lot of work to do on it still, but here are a couple of pictures of it so far. As you can see, it's rather large. And believe it or not, part of me wants to make it even bigger, but I should probably stop. I am looking forward to finishing this piece so I can play on it. Two more models done for my Cadian army. I completed the Regimental Advisors for my Cadian IG army this weekend. I had fun experimenting with some new painting techniques on these models, and I am very happy with the way they came out. With the Officer of the Fleet, it is the first time I tried painting a white outfit. I used Codex Grey as the base coat, and then painted Skull White over it. I washed it with more Codex Grey that I thinned down with water, probably a 60 (water)/40 (paint) mix. Finally, I highlighted it with more Skull White. It came out nice. With the Astropath's robe, I base coated it with Catachan Green and highlighted it with Camo Green. Then, I washed it with Orc Flesh Wash (not watered down). That is all I did and I really like how it came out. I have completed my first challange for March, my Cadian Company Command Squad. They came out pretty good. I tried some new painting techniques on them, like the glowing blue on the plasma guns. 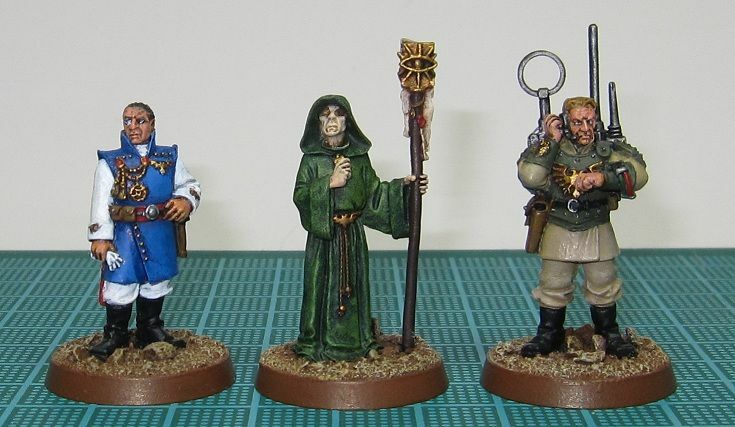 I am still working on the Regimental Advisors and should be done with those in a day or two. I decided to go through all my 40k armies this week and total up the all the points that I have painted for each one. I was a bit surprised by the results. The number was a bit higher than I expected on some of them. With Necrons, I thought I had more painted than that. Sadly, I still have at least twice this number in overall points for all my armies to paint. Another surprising thing I realized as I was doing this was that I only had three models left to paint for my Nurgle Daemon army and it will be entirely painted! The three models are Epidemius, a Plague Hulk, and a Herald of Nurgle. I guess I have my Painting Challenge projects for next month. However, I still have three models I want to add to that army before I would considered it complete. 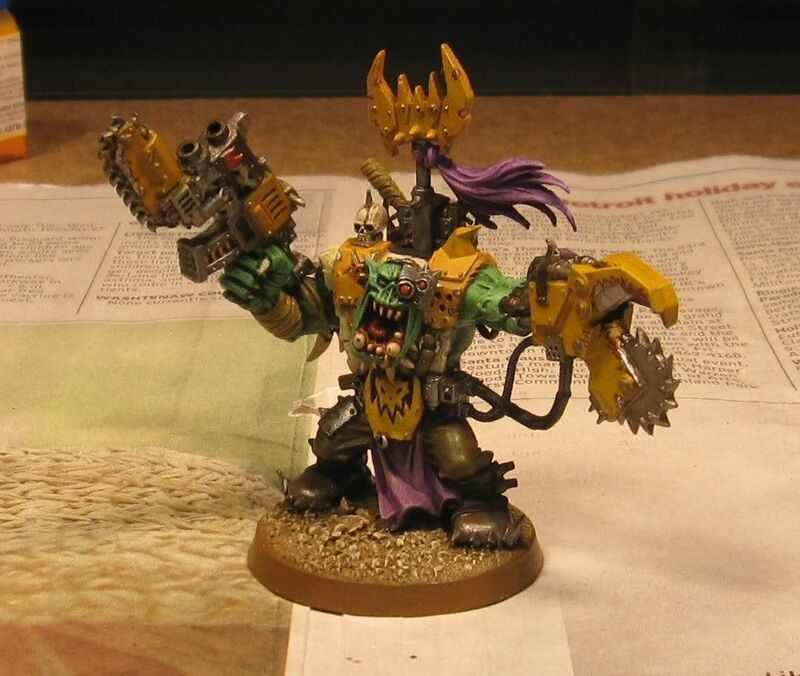 I need to get Scabeiathrax, the Forge World Greater Daemon of Nurgle, and a third Blight Drone. At some point I would also like to model Ka'Routh the Unstoppable. If I ever want to use him, it must be a WYSIWYG conversion. For the rest of my armies, I just need to keep painting. Someday I will get it all painted. Games Workshop has posted the new Grey Knight codex and models in the Advance Orders section. Release date is April 2nd and includes a bit a stuff, including the new Dreadknight. 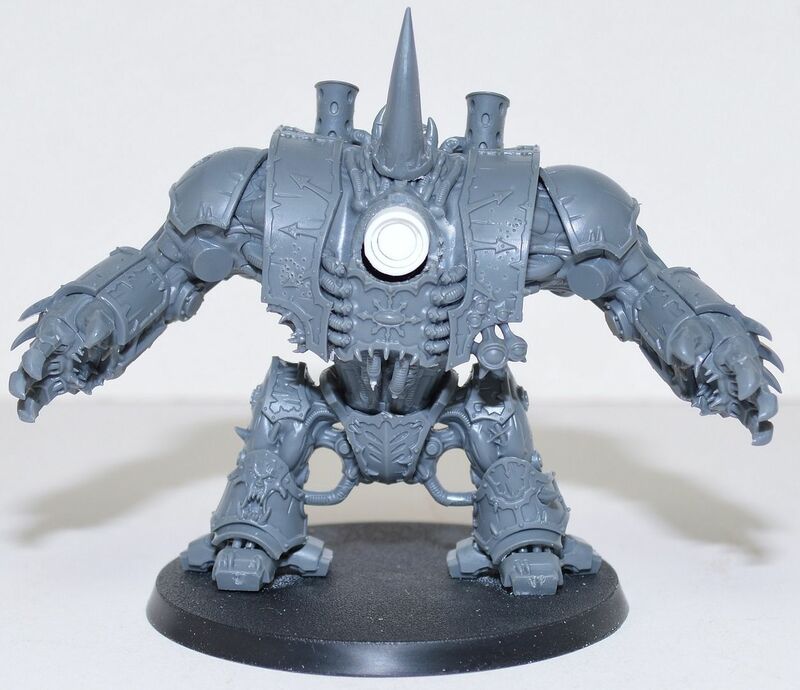 I am not sure what to think of the Dreadknight, it looks a bit out of place in the Warhammer universe, but it is pretty cool model though. The Grey Knight and GK Terminator kits look good, and the new Special Character, Lord Kaldor Draigo, looks really good. 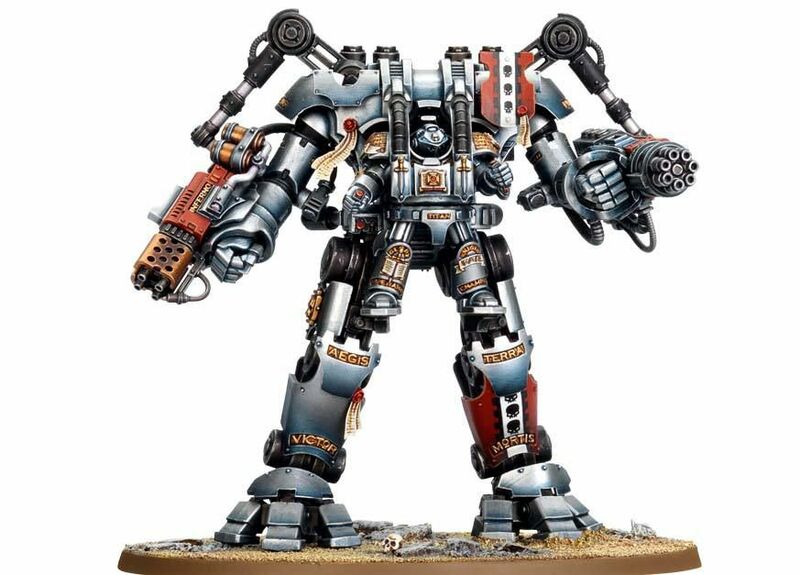 Grey Knights look like they are going to be a really interesting army. Here is a picture of my Cadian Command Squad work in progress. I think they are coming along good so far. I tried for the first time to make the top part of the plasma guns look like it was glowing blue. I am not entire happy with the way it came out. I guess I just need more practice at painting stuff that glows. 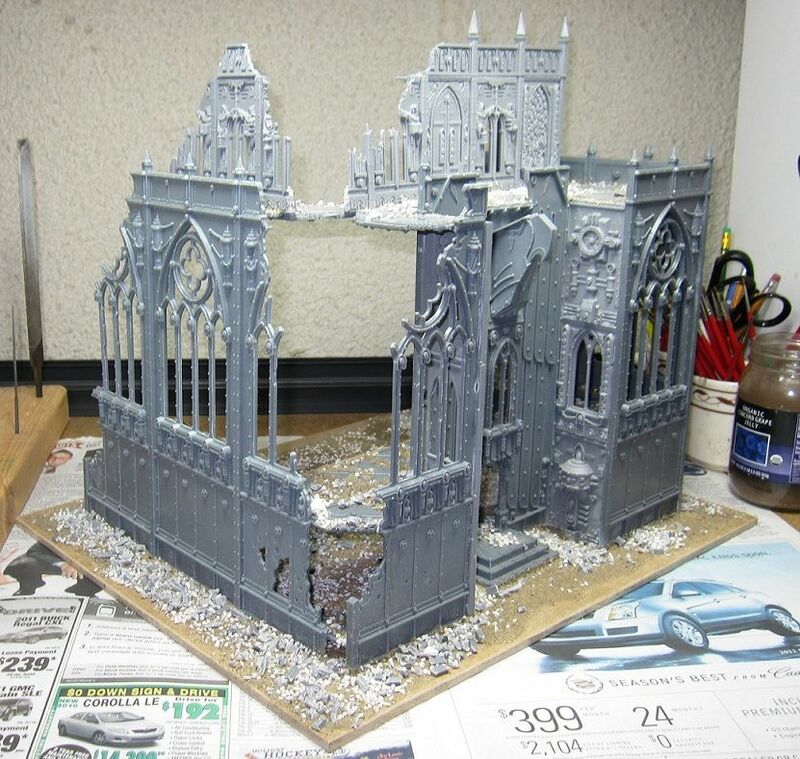 I have decided to start a new challenge for myself beginning this month, the 'Finish a Project' Challenge, and I will be doing this in conjunction with the 40kFightClub.com 2011 Painting Challenge. In addition to having lots of unpainted models, I have a fair number of partially painted projects that need to be finished. Here is how it will work. As I choose a project for the 40kFightClub.com 2011 Painting Challenge each month that is unpainted, I will choose a partially painted project from the same army and finish it in addition to my other project. This way, I can potentially finish two projects each month. I got the idea for this because of my March painting project. 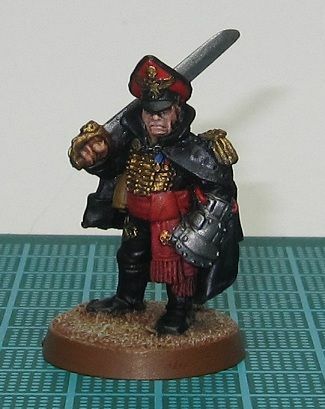 I wanted to paint my Cadian Company Command Squad, but I had already started painting some of the models a while ago. So, I decided to paint the four Veterans and a special character that were all unpainted and would fulfill the Painting Challenge requirements, and I told myself that I would finish painting the rest of the squad as well. Hopefully, this will help with my Warhammer ADHD and keep me focused on completing an army or two. Thursday Night was my second game with my new Blood Angels army. It was a 1250 point game against Imperial Guard. The mission was Capture & Control and deployment was Spearhead. It was a pretty decisive victory for the Blood Angels thanks to some deadly accurate Descent of Angels rolls. Here is my list. For this list, I started with my 1500 point list from my first game and started chopping it. The first couple of things to go was the Baal Predator and the Sanguinary Priest's power weapon. I also dropped the Power Weapon and Rhino from the Death Company, as well as reduced the squad size. Since we were playing for objectives, I Combat Squaded all my Assault Marine units. I was forced to go first. I deployed my Death Company as close to the center of the table as I could since their Black Rage was going to drive them across the table anyway. When I Combat Squaded the Assault Marine unit with the Rhino, I put the Sergeant and Meltaguns in one unit inside the Rhino (to help protect from outflankers) and the other on top of the objective in my deployment zone. Everything else was held in reserve. The game was pretty much decided on turn two when all my DoA Assault Marines came in and landed perfectly to punch some big holes in the Guard's gun line. The Librarian destroyed a Chimera and a Lascannon team with Blood Lance (the second wound to the Lascannon team was from the exploding Chimera near it). The remaining Lascannon teams ran off the table after that. Another Chimera was popped by the Assault Marines with Meltaguns who landed just four inches away from it. One ten man Guard unit was wiped out by the Flamer Marines who landed in perfect position to do so. The Furioso, who arrived on turn one, wiped out a Squad of Autocannon Heavy Weapon teams on turn two. My opponent got some revenge on turn two when his LR Demolisher rolled onto the table. It got a perfect hit on the Librarian and his unit with the Demolisher Cannon, wiping out all but the Librarian. However, the Librarian died from Lasgun fire from the guardsmen who were in Chimera he destroyed. On turn three, the Death Company made it to what was left of the Guard line and started reeking havoc, and the Jump Pack Meltagun Marines jumped over to the LR Demolisher and destroyed it. An outflanking unit of Penal Legion came on in my deployment zone on turn three, but they were wiped out by the Assault Marines guarding my objective. The next turn, an outflanking squad of Storm Troopers arrived in my deployment zone and killed one of the two Combat Squads with their Hot Shot lasguns. It was a fun game for me, unfortunately not so much for my opponent. We called in on turn five when there was no possibility for my opponent to claim any objectives. It appears Blood Angels can be quite deadly when they want to be. A little over a month ago, I traded an old WHFB Dwarf army for a Blood Angels army and over the past month, I have slowly been working on getting this army ready for playing. In this time, I acquire three of the new Furioso Dreadnought kits that were released in February and although I got them assembled a couple of weeks ago, I am just now getting around to posting them. So, here are my four BA Dreads. The fourth one is an AoBR Dread that I had and never did anything with until now. I built one of each Dreadnought type: Furioso, Librarian Furioso, and Death Company. These kits are really nice. I built all three of the Magna Grapples, but I did not glue them on. They fit quite snug and stay in place on their own without needing magnets, which is nice. As for my other BA stuff, I have been working on the Stormraven my family got me for my Birthday last month. It is about 50% built, I am trying to decide on the best way to magnetize the weapons before I finish building it. I have not assembled my Saguinary Guard yet, I am trying to decide the best way to equip them before I do. I am in no rush to paint my BA army right now given all the other stuff I have to paint. I would rather keep the army unprimed and unpainted until then. 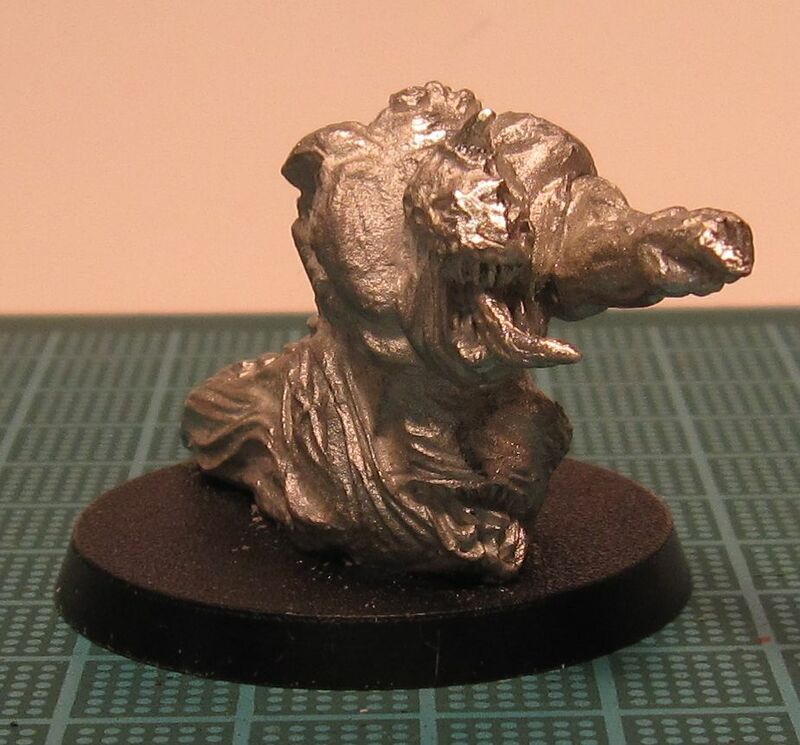 A couple of days ago, I was looking through the APOC Data Sheets on GW's website and I noticed the Nurgle Plague Tower data sheet. After reading through it, I feel I simply must build one. I have a great idea for it. I would start with a Shadowsword kit and I would build the basic structure of the tank. I would build the Pus Cannon so that it sticks straight out of the front of the tank body, much in the same position as the Volcano Cannon. Then I would build a wooden tower out of the top of the tank with the two Demolisher cannons on the front of the tower and the Plague Mortar on the top. 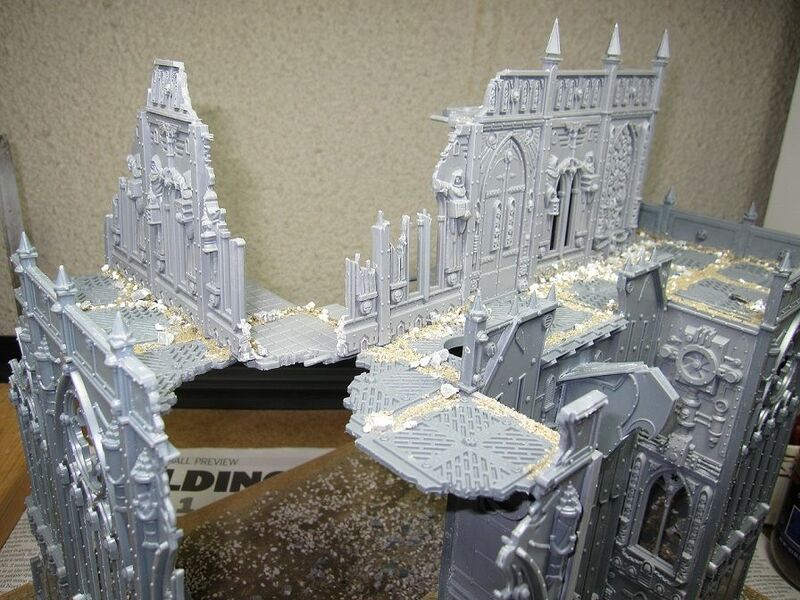 I would add bits of armor plating to cover some of the wooden tower. There would also need to be some kind of Pus tanks, maybe a big open one on the back with pipes leading to the weapons. What do you think, should I build one? 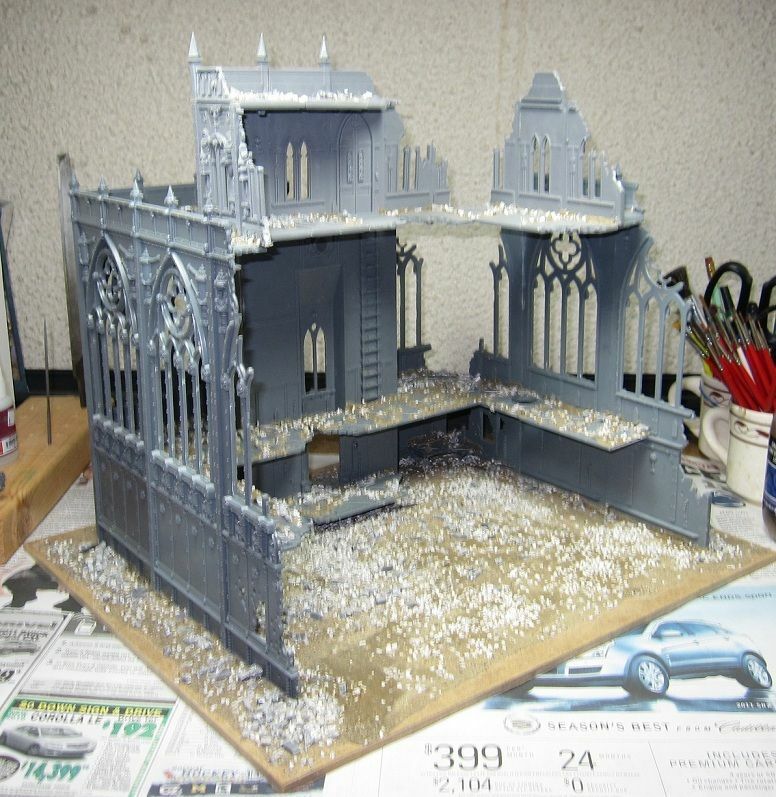 Even though I do not get to play APOC as much as I would like, I would still love to build one simply for the joy of building it. 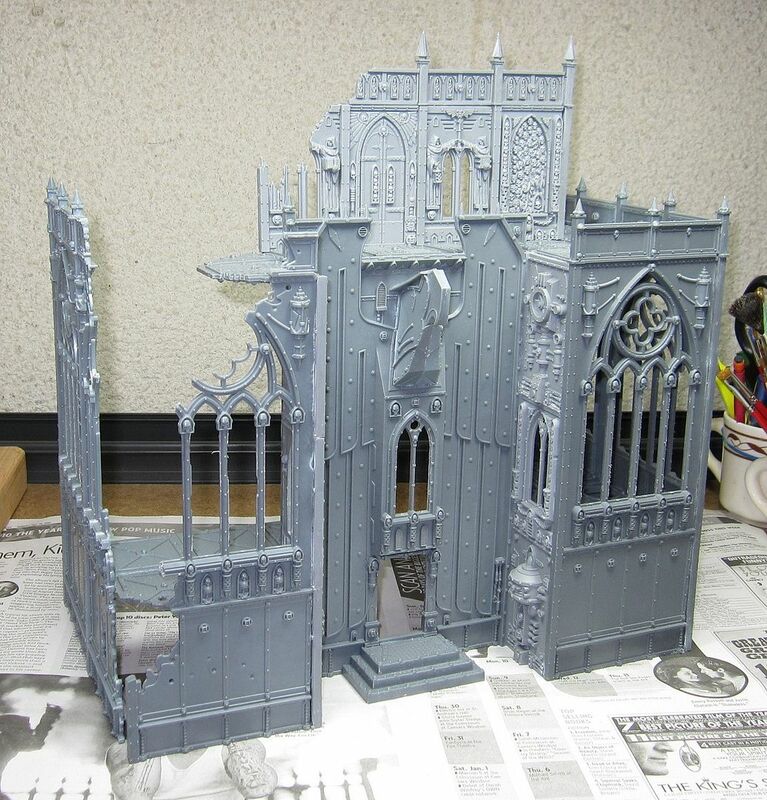 It would look awesome and would be a great centerpiece for my Blightlords army. 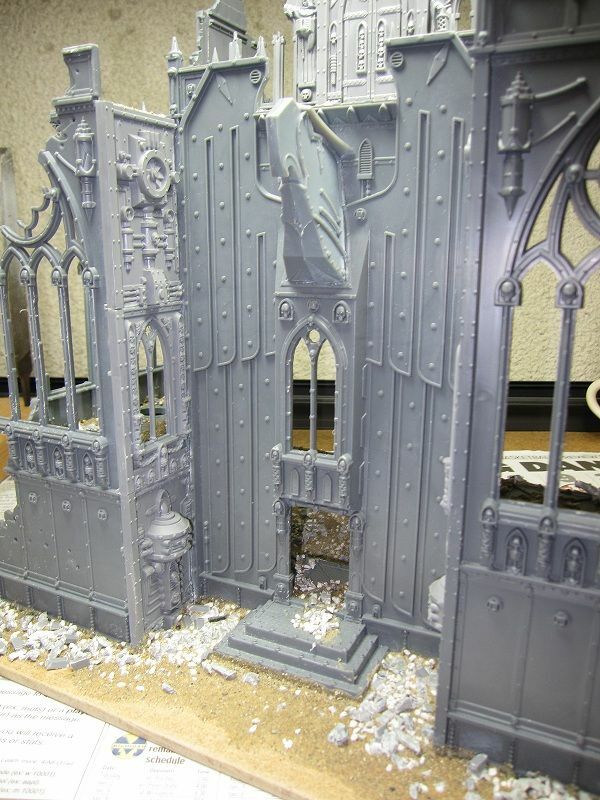 This month I am not going to wait until the last minute to get started on my 40kFightClub 2011 Painting Challenge Project. 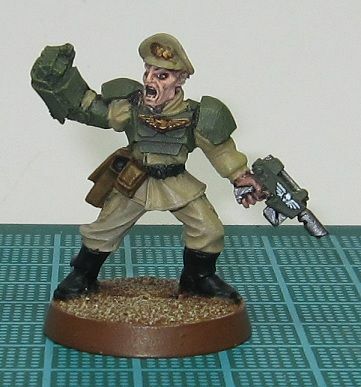 For March, I am going to choose a project from my Cadian 8th IG army since it has been a while since I have done anything with my guard army. I am going to paint the Company Command Squad. 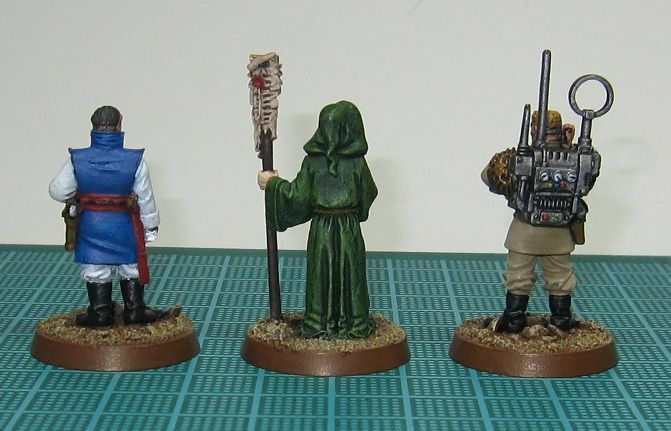 I had already started painting this squad a long time ago, and since it needs to be unpainted for the Challenge, I am going to paint Lord Castellan Ursarkar Creed and four veteran Guardsmen with Plasma Guns. This will count as a minimum sized unit that is required for the challenge. However, I am also going to finish painting the rest of the squad, plus another Officer with a Power Fist that needs finishing since I prefer to paint in units of five models.